Patrick Hruby: Soar or Bore? Almost 50 years ago, Martin Luther King Jr. stood on the steps of the Lincoln Memorial and gave arguably the most powerful American political speech of the 20th century: “I Have a Dream.” An impassioned call for racial equality. A soaring vision of social unity. A moral and stylistic tour de force, rife with literary and biblical references, delivered in the urgent, gripping cadence of a Baptist sermon, a 17-minute oratorical masterpiece that remains stirring and resonant to this day. Almost six months ago, President Obama stood behind a lectern at George Washington University, where he said something about limiting itemized deductions - and appeared to put Vice President Joseph R. Biden to sleep. In the gulf between the two addresses lies a riddle: Whatever happened to the lofty, emotional, go-for-broke style in American political discourse - from Mr. Obama, whose electrifying speechcraft once made him our time’s most promising heir to that tradition, on down? With the president set to speak at the rescheduled dedication of the Washington, D.C. Martin Luther King, Jr. National Memorial on Sunday and facing a daunting re-election battle amid a nationwide mood of division and malaise, the answer could have a significant impact on the 2012 campaign. “I think there has been a loss,” said the Rev. Al Sharpton, a civil rights activist and MSNBC television host. “You still see a few people speak that way [in the black community], but not as many. Stemwinders haven’t been the norm for a good while - not in the nation that made Al Gore and Bob Dole serious presidential contenders - but stylish, memorable speeches weren’t always rare. Mr. Obama’s 2004 speech at the Democratic National Convention - an energetic call for national unity during a bitterly contested presidential campaign - made the Illinois state senator an overnight political sensation. In 2008, similarly charged addresses played a major role in Mr. Obama’s defeat of Democratic challenger Hillary Rodham Clinton and Republican nominee John McCain en route to the presidency. At the time, Mr. Obama’s head speechwriter, Jon Favreau, told reporters that he drew inspiration from King and Kennedy. A linguist noted that Mr. Obama used cadences similar to King‘s. Since taking office, however, Mr. Obama’s major speeches have taken on a businesslike, subdued and even flat effect - less reminiscent of King’s full-throated call and response than of a corporate middle manager giving a regional sales presentation. In part, the difference between Mr. Obama’s campaign and presidential rhetoric reflects the difference between running for office and attempting to govern. Successful candidates take stands, pick fights and draw principled ideological contrasts with opponents, because elections are winner-take-all quests; successful officeholders have to balance that approach with pragmatic, low-key compromise, because making and enforcing laws is anything but. So as Mr. Obama’s political strategy pivots toward the 2012 election, his speechmaking has begun to show flashes of his former energy - most notably in a jobs bill address to Congress and in a speech to the Congressional Black Caucus in which the president called on his black supporters to “stop complaining, stop grumbling, stop crying” and get to work. Governing aside, Mr. Obama’s tamped-down rhetoric fits a larger trend of flattened political speech. Start with modern media. Scholars long have argued that electronic communication is essentially “cool” - that is, while an in-person orator needs an amplified voice, a speaker on radio or television is better served by restraint. The rip-roaring address of yore became the fireside chat of Franklin D. Roosevelt, a personal conversation between a politician and each individual audience member. John Carroll, assistant professor of mass communications at Boston University, said shifts in digital media - to social networking, instant messaging and a round-the-clock news cycle - have further dulled the public’s ability to process complex argument and formal rhetoric, while fostering a taste for addresses that are simple, punchy and visual. If the media landscape has changed, so too has the political climate. Faced with a closely divided electorate in which less ideological, more pragmatic independents often form the deciding swing vote, politicians need to look both ways before crossing. Speakers like King essentially delivered sermons intended to challenge and provoke. Modern politicians are delivering poll-driven marketing messages designed to satisfy diverse constituencies while alienating as few listeners as possible. When King gave his “I Have a Dream” speech, he included references to the Old Testament and Shakespeare, Lincoln’s second inaugural address and the Declaration of Independence, weaving a symbolic tapestry that gave his words more power and resonance. Similarly, Reagan’s reference to “a shining city on a hill” borrowed from Kennedy, who borrowed from Puritan leader John Winthrop, who in turn borrowed from the Sermon on the Mount. In contrast, Mr. Carroll said, contemporary listeners largely lack a lofty set of shared cultural references. 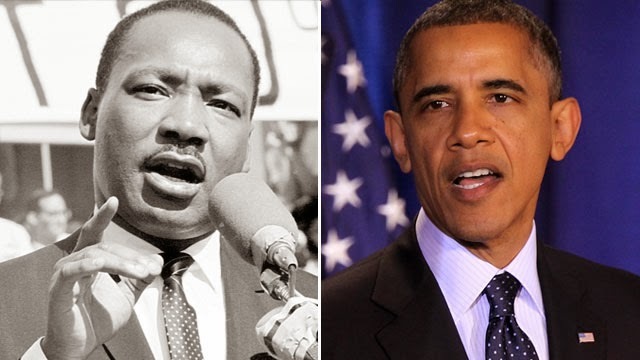 So, too, it seems is the deflation from King’s gripping speech - the final crescendo delivered without notes, drawing on King’s background as a Baptist preacher and two decades of public speaking - to today’s humdrum addresses, from the charismatic Mr. Obama of “Yes we can” to the businesslike Mr. Obama of laundry-list economic proposals. Mr. Sharpton - no stranger to a King-like speaking style - said that development isn’t entirely lamentable. “In King’s time, we couldn’t go to certain schools or be in boardrooms,” he said. “The black church was the only place leaders were trained and developed. Now you have black CEOs, a black president, people from more academic backgrounds, with a more dispassionate style. Besides, Mr. Sharpton said, there will always be a place for a rousing, old-fashioned speech, the kind King made into an art form. “You’re dealing with people now who are treated as consumers buying a product instead of people hearing a message,” Mr. Sharpton said. “People who are sold, not moved. Speakers who can get your attention, rather than get you to focus and believe in something. But when you see protests, marches and movements, you see them still led by people that speak with passion.